Instagram pictures have invaded every corner of your socially networked world. So it's only fitting that those snazzy, heavily dusted images start popping up in real life—city skylines and poached eggs should look great on a pillowcase, right? Right? Here's everything you can do with those Instagram pictures you're so very proud of. Obviously, the most obvious thing to do is to just print 'em out! 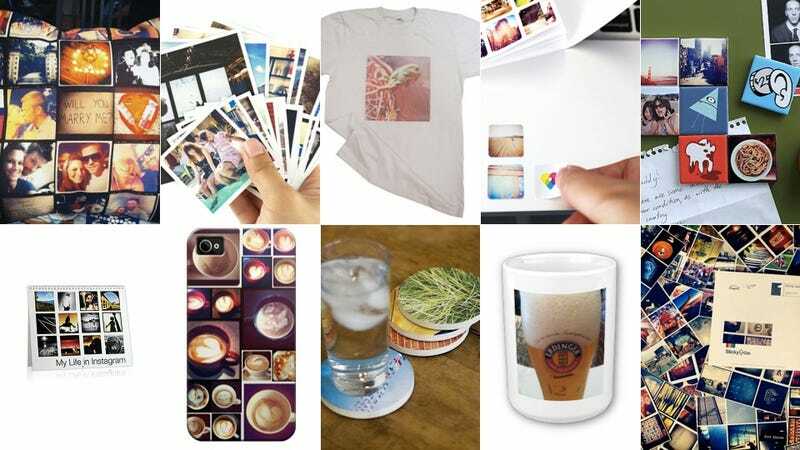 Printstagr.am and CanvasPop are especially popular picture printing services. For $12, the former offers two size options—a set of 48 for minis or a set of 24 for Polaroid-like squares. The latter makes super elegant Instagram prints on actual canvas for $40. Printstagram even offers a 20"x40" poster that you can hang in your uber-cool loft for $25. and your oh so drunk friends. Stitchtagram makes handmade 15-inch pillows covered in Instagram pictures, and if you stay within a certain theme, they actually turn out quite well. It's like creating your own graphic tee—an Instagram photo on an American Apparel T-shirt. I don't know if I'd do it. But it's only twenty bucks, it's not that bad. Get one here. Only fitting to plaster your Instagram photos on the phone responsible for your Instagram photos! Can you imagine the time/space worm you'd create if you used an Instagram iPhone case of you taking a picture with your iPhone in that case in front of a mirror? Like having a phone with a picture of you taking a picture and then taking another picture? Do it with Casetagram. These round sandstone coasters from Coastermatic got the thumbs-up approval by our features editor Harry Sawyers who fancies himself many a drinks. Though secretly, I wish they were square. 4 for $25 at Coastermatic. I can see it now. January shows a heavily filtered, horrible picture of the Times Square ball, February has a purposely shortened shot, throw in a rainy day for April and a double rainbow in May and you're on your way to a self-curated calendar by Keepsy. I want to see a calendar filled with Instagram pics for every single day. I don't know if most people grow up and pretend they never loved stickers but that ain't me. This one has obvious appeal. $10 for 252 stickers at Printstagram. 252! Your fridge just got cooler. (Sorry.) $15 for 6 magnetic magics at Stickygram. Your mug just got hotter. (Sorry, again.) $18 for a mug at Zazzle. Cover an entire wall, see pictures while you shower, turn your kitchen floor into a shrine or just have a unique one-off ceramic snapshot. Classy-ish. Starting at $4 for a 2 x 2-inch tile at ImageSnap.